RUSH: Now, there are other interesting aspects to this. Would you believe me if I were to tell you that the news media — the Drive-Bys — are frustrated today over this shooting? Oh, they are, folks. They are frustrated as they can be. And you know why? They are frustrated because this shooting has knocked the Rob Porter scandal from the headlines. In fact, if you think that I’m exaggerating this, I have here a story in my formerly nicotine-stained fingers. It’s from TheHill.com: “White House Plans to Skip Press Briefing for Second Consecutive Day — The White House’s public schedule of events for Thursday does not include a press briefing or any public events for President Trump a day after a mass shooting at a Florida high school. They are mad. Because, folks, to them the Rob Porter story is the latest that they think it now might be possible to get rid of Trump. This is the story that could probably drive Trump from office. It could force Trump to change his chief of staff. It could force a staff shakeup, and it could force Trump to bring in other people to fill these jobs. All of which could give the media an open shot at Trump and his incompetence and the danger his administration poses to women because he hires people like Porter. Do not doubt me. If you are still doubtful, whether I knew this: This is Cecilia Vega, who is the White House correspondent for ABC News late yesterday afternoon. VEGA: We are expecting a briefing, uhhh, within the hour from Press Secretary Sarah Sanders. And of course as you know this very tragic incidents comes as this White House is in turmoil right now over this Rob Porter scandal. So they’ve got a lot on their plate here. RUSH: What does that have to do with anything? What does the Porter scandal have to do with this? What is the linkage of the Porter scandal and the shooting in Florida? And of course the briefing was canceled, the briefing was canceled — and they couldn’t wait for the briefing because they wanted to zero back in on Porter. Somebody asked me in an email, ’cause this relentless, nonstop media coverage… Porter’s gone. Porter’s been gone how long? A week now? So he’s gone. Whatever he is, he’s gone. The process of how Porter ended up getting gone, that is the story. And this relentless media pressure works even on the wisest, most informed people. I’ve got some panicked people over the course of the last few hours sending me emails asking me if I think this Porter story is actually gonna be what gets rid of Trump. “Is this what’s gonna allow Trump’s enemies to get rid of him? Is this where it ends?” Let me just answer to all of you right now: No. The Rob Porter story is not the end of Trump. There’s only one end to Donald Trump. There’s only one thing that would bring about the end of Donald Trump, and that is the wrong immigration bill being signed into law. Anything featuring comprehensive amnesty for every illegal immigrant or something pretty close to that, that’s the one thing that can bring Donald Trump down because that’s really the primary reason he was elected. The Porter story is not gonna be the thing that brings him down. I just wanted to let you know, the Drive-Bys are frustrated that this shooting has taken the Porter story, ’cause even to them gun control’s an old story. They’re having to recycle what they do. But the Porter thing! That was brand-new. That was fresh. The dossier story has fizzled. The collusion with Russia has fizzled. The obstruction story? Until Mueller speaks, we don’t even know what’s going on there. But the Porter story? Oh, man! Salivating, they were. Which means, by the way, that the media — which is out to harm Trump, which is out to end Trump’s presidency. Make no mistake about it. I was taking an unnecessary risk and sounding very insensitive. I was not doing anything of the sort. I was telling you the way it is. I said the Drive-Bys are frustrated that this story has taken the Rob Porter story off the front page and out of the news. They are frustrated. The White House has canceled the daily briefing both yesterday and today, and in the story where they reported that they expressed their frustration. They’re mad because they’re not gonna be able to ask any questions about the Rob Porter story because they are convinced that the Rob Porter story is how they’re gonna get rid of Trump by reviving all of this sexual harassment stuff that he has seemingly escaped so far. Despite the fact that many people thought I was taking a risk by even predicting this, it was no risk; it was the truth, and now I have evidence for you. Now I have evidence. COOPER: We are also following other breaking news. 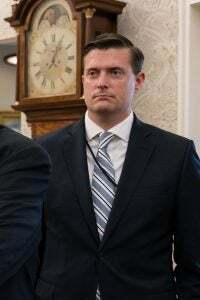 This one out of Washington, CNN has learned that Rob Porter told one of his ex-wives in September that he was informed that his security clearance check was delayed partly due to concerns that he was violent. CNN’s national politics reporter MJ Lee joins us now with more. So e-e-e-explain exactly what we know, ’cause this raises new questions about what the White House knew and when. LEE: That’s right, Anderson. Uh, Rob Porter’s second ex-wife, Jenny Willoughby tells CNN that Porter called her in September and told her that he was informed that his security clearance was delayed and that one of the reasons was because of concerns that he has been violent. 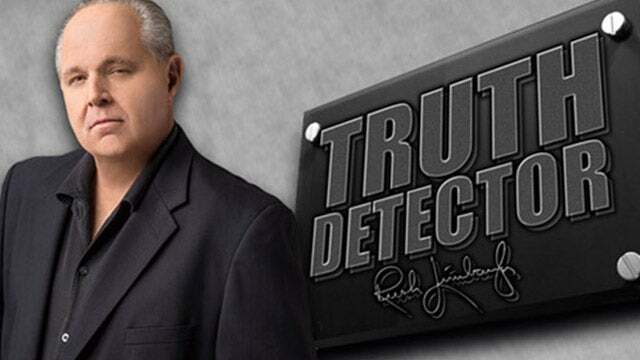 RUSH: That was breaking news. That took CNN away from a gun-control opportunity. 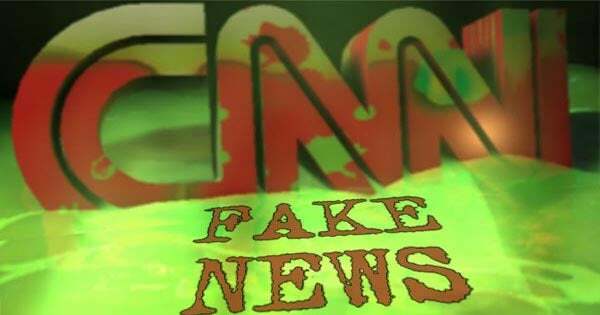 That took CNN away from wall-to-wall coverage on the Florida shooting at the high school. That, the fact that Porter’s wife said that Porter told her in September that his security clearance was being held up because there were concerns he had been violent. As you heard Cooper say (summarized), “The reason why this matters is because it gets to the timeline! “It gets to exactly to when Trump knew what he knew, what the White House knew and when they knew it!” They’re gonna try to get Trump for lying, the White House for lying. They knew all along this guy was a bad actor, sexual abuser and they tried to cover it up — or worse, they don’t care, because they don’t care about women! They don’t care about women! Women are just objects. Women are just there to take up space. So this is the picture they’re trying to paint. So there you have it, breaking news. Do not doubt me when I tell you what these people are about, what inspires ’em, what motivates ’em, and what their objectives are. Do not ever doubt me. The Rob Porter story! It’s just the latest that’s got ’em all hyped up thinking, “This is it!” This is the story where they either individually or collectively are gonna get rid of Donald Trump.